The migration of immersive media towards telecommunication applications is advancing rapidly. Impressive progress in the field of media compression, media representation, and the larger and ever increasing bandwidth available to the customer, will foster the introduction of these services in the future. One of the key components for the envisioned applications is the development from two-dimensional towards three-dimensional audio-visual communications. provides an exhaustive bibliography for further reading. 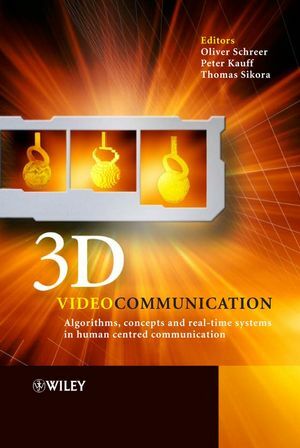 Researchers and students interested in the field of 3D audio-visual communications will find 3D Videocommunication a valuable resource, covering a broad overview of the current state-of-the-art. Practical engineers from industry will also find it a useful tool in envisioning and building innovative applications. Dr Oliver Schreer, Heinrich-Hertz-Institute, & TU Berlin, Germany Oliver Schreer is Adjunct Professor at the Faculty of Electrical Engineering and Computer Science, Technical University Berlin. He lectures on Image Processing in Videocommunications and is a regular guest editor for the IEEE Transactions on Circuits, Systems and Video Technology. Peter Kauff is the head of the “Immersive Media & 3D Video” Group at Heinrich-Hertz-Institute (HHI), Fraunhofer Gesellschaft, Berlin. He has been involved in numerous German and European projects related to digital HDTV signal processing and coding, interactive MPEG-4-based services, and advanced 3D video processing for immersive tele-presence and immersive media. As the chairman of the ISO-MPEG video group (Moving Picture Experts Group), Dr Sikora was responsible for the development and standardization of the MPEG video coding algorithms. He frequently works as an industry consultant on issues related to interactive digital video. He is an appointed member of the Supervisory board of a number of German companies and international research organizations. He is an Associate Editor for IEEE Signal Processing Magazine and the EURASIP Signal Processing: Image Communication journal and currently serves as the Editor-in-Chief of the IEEE Transactions on Circuits and Systems for Video Technology.